Calling abroad was pretty expensive until some time ago. An international calling plan isn’t that easy to get, but there are some apps now that can help you call abroad your friends or your family. 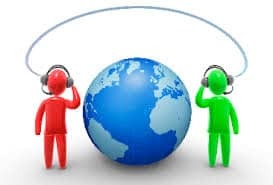 Everybody knows Skype and Viber, but there are other apps that are very good, apps that make voice internet protocol ( VOP) calls via Wi-Fi networks or even on your 3G data. Bolt is one of the newest apps on the market. It has one advantage that other don’t have: it combines free calling with a complete phone dealer app, which replaces the stock one on your Android device. This means that you mustn’t switch to the app to do an internet call. If someone calls you on Bolt, the devices will switch to VOIP calling, using your mobile data. It seems that a average Bolt call takes 60 KB of data per minute. So if you have 2 GB of data you’ll have almost 35.000 minutes. Facebook Messenger is pretty old on the market. It is a very good VOIP apps for local and international calls. It runs very good on devices that have Android 2.0 and it has a clear sound on a call. Talkatone uses Google Voice, this meaning that it works just on American soil. It is an app that gives free VOIP calls on Wi-Fi, 3G and 4G networks.For non-Americans, you can use GrooVe IP, but you will have to pay to use mobile data. We think that these free calls will be incorporated in the future in Google Hangouts app. To make Talkatone work, you should install it and log in with your Google account.